Rollings Stones – Let it Bleed - 1969 UK 1st pressing on the unboxed MONO red Decca label - LK 5025 with 1A /1A matrices. In MINT condition. Comes complete with poster and original 1st issue stickered sleeve and uncensored red inner. 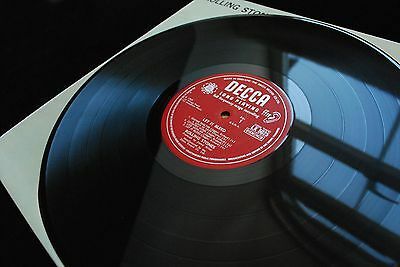 20th century collectables usually concerns itself with selling high quality Beatles vinyl, however there are exceptions and this ultra rare UK 1st pressing of the classic Stones album Let it Bleed in mono is one of those exceptions. This copy was pressed ahead of the December 5th 1969 release date. This is the Stones at the height of their musical powers; on release it went straight to number one, displacing Abbey Road by The Beatles. It would be the last Stones album to be released in mono. An investment grade copy with MINT vinyl, possibly unplayed or at the very least played only once. By 1969 mono had all but been phased out and as such only a small amount of mono copies were ever pressed. EMI and the Beatles by this time had abandoned mono altogether. 1st pressing mono copies of this album are therefore extremely rare but to find one in such beautiful MINT condition is an opportunity not to be missed. However what makes this copy so remarkable is not just its condition but the fact that it carries the very early 1A/1A matrix to both sides, these early first pressings were pressed in tiny numbers before they were changed to the 2A matrix and so whilst it would be a difficult task finding a 2A matrix copy in this beautiful condition to find a 1A/1A copy in such remarkable is exceptionally difficult and near on impossible. The ultimate upgrade with serious investment potential. In truly remarkable condition. The vinyl is completely unmarked, even under a strong halogen desklight nothing is revealed. A stunning looking MINT disc which looks as if it left the pressing plant yesterday. Certainly investment grade condition and ultimate upgrade. The disc lies 100% flat on the turntable. A stunning set of factory fresh red Decca labels. One very careful playback confirms that the audio is undamged. Tremendous mono audio and so very different from the stereo version. The record does not skip or jump. An original 1st issue stickered cover in immaculate shop fresh condition. A stunning example of a cover which was prone to damage. The front panel retains its original high gloss sheen and is completely unworn. The back panel is also in remarkable condition. This cover which is 46 years old looks like it left the factory yesterday. Original and fresh, red uncensored Bach Choir inner with factory and storage creases. PLEASE NOTE: 1st class next day Special Delivery to UK addresses will be 8.50 GBP. For worldwide shipments please email me for price. This record has been strictly and conservativelygraded to ‘UK RECORD COLLECTOR' standards.